You’ve tried consulting with Zoltar and online psychics, and you even gave that DIY flux capacitor a whirl. 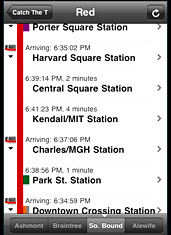 But no matter what, you’ve never been able to accurately predict the arrival times of the T.
Introducing Catch The T, a new app for your iPhone that provides you real-time data and schedules for the MBTA, now available. So the next time you’re running late for work and aren’t sure if you have time to pop off for a coffee (or maybe one more quick “intern consultation”), pull up this app. As the train passes through each station, the app will update itself and predict when the train should arrive at the next stop, allowing you to commute with more strategery and make better use of your precious time. Like figuring out why your driver isn’t picking up his phone, forcing you to take the T.